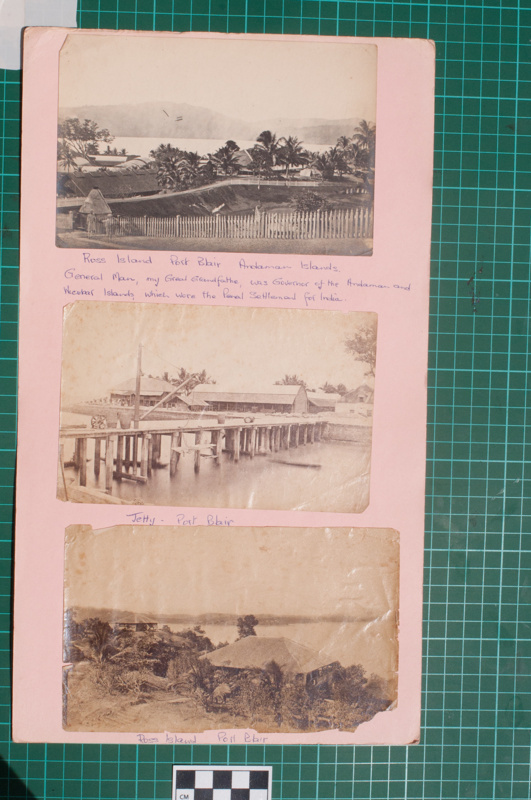 Three photographs mounted on a pale pink foolscap card with handwritten annotations in blue ink below. Described from top to bottom, left to right. Top: A photograph of the surrounds of Ross Island, Port Blair, showing a picket fence with palms and bungalows in the background and South Andaman Island (location of Port Blair) in the far background over the sea. The picket fence probably surrounds the central pond in the middle of the island. The image is described by Gwenda Elizabeth Donaldson (nee Laughton b. 1915 d. 2010) "Ross Island, Port Blair, Andaman Islands. General Man, my great Grandfather, was governor of the Andaman and Nicobar Islands which were the Penal settlement for India." Middle: A photograph of the jetty at Port Blair with wooden buildings in the background. This image is probably from Ross Island itself, rather than Port Blair proper. 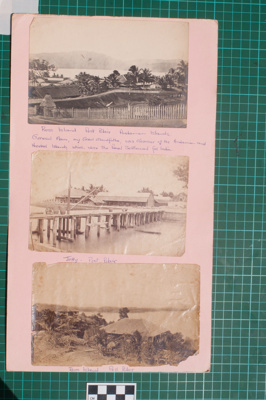 Bottom: A photograph of Ross Island at Port Blair showing wooden bungalows. In the distance is another island, probably South Andaman Island.